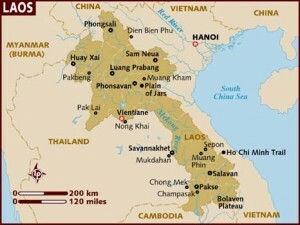 Of all the countries we’re planning on visiting, I think Laos is the most ‘off the beaten track’. Having only been open to tourism for 20 years, it’s not a huge tourist destination but those that have been seem to fall in love with it, and the people. We’ll start by crossing from Northern Thailand into Huay Xai, Laos. Most people don’t stay here more than a couple of hours, but I’ve heard there is some good trekking out of here and a chance to interact with gibbons just a little north, so maybe we’ll hang out for a couple of days before heading east to Luang Prabang by boat. When I was first researching about traveling in Laos, I read about a ‘slow boat down the Mekong river’ and thought it sounded oh-so-idyllic-and-peaceful. I imagined lounging and chatting with a few other tourists and locals while watching the scenery slowly float by, arriving in Luang Prabang relaxed and rested. Good job I kept reading and researching! The ‘slow boat down the Mekong river’ may be slow but it is anything but peaceful and relaxing – typically it is a long, narrow boat stuffed with as many as 100 or more tourists and all their stuff. It still might be the best way to get there, but it’s best to keep my expectations in check! Luang Prabang isn’t that big (pop. 26,000) but it is a central trade hub between Laos, Thailand and China and, with it being a UNESCO World Heritage site, there will be plenty to see. This area is also good for trekking (with elephants maybe? ), white water rafting and cycling. It might be nice to get on a bike again! My original plan was to leave Luang Prabang and continue east overland to meet up with the Vietnamese border but I have not found a good route between Luang Prabang and Hanoi. It doesn’t seem that many people do it and those that have tell tales of horrid bus rides and poor infrastructure. So now I’m thinking that we’ll head south to Vientiane and fly from there to Hanoi. As we head south to Vientiane, we’ll have a chance to see the Plain of Jars. Quite literally a plain, meadow-like area strewn with massive stone jars. Another one of earths mysteries like Stonehenge, or the Moai statues on Easter Island – huge structures carved out of rock and no real explanation. Vientiane is a larger city and most sites are centrally located so it is a city for walking. We’ll visit the National Museum and the Buddha Park, but mostly it’s just chilling that gets done here – Laos has a distinctive slow pace. The Phu Khao Koay National Park is just outside of Vientiane. There is trekking here with the added draw of seeing elephants, gibbons, asiatic black bears, tigers and leopards. Laos sounds like an amazing place to visit, relax and enjoy. It might test our travel abilities but, by then, we should be pretty travel savvy and be up for the challenge. You’ll love it. I went their on holiday…and came back determined to travel full-time. I had three weeks there in 2007/8, and am planning to go back for more towards the end of my trip. It’s good to see you’re giving time to Vientiane, lots of people skip through very quickly, whereas I loved it, it must be the most laidback capital city in the world. Do you have no time to head further south? Once you get south of Vientiane, you get fewer and fewer tourists, and it’s a beautiful area neglected by most. Gillian – once again we’re leading parallel lives -I’ve got a “This Time Next Year” post already written about Laos, though I won’t be uploading it until next week. Oh – and my house has had about 26 showings in its first two days on the market – and the Open House is today! You guys, I’m so excited you’re going here! Try to catch Anthony Bourdain’s Travel Channel show on Laos from last season — he visits a farming family impacted by American mines still scattered across the countryside, explores the food, and takes his film crew to the Plain of Jars. Incredibly moving episode, and it’ll further whet your appetite for Laos! Laos is a wonderful place! We spent a full month there and it wasn’t nearly enough time. Consider going south to Champasak and the 4,000 Islands as well as a trip through the Bolaven Plateau on a motor bike! Those are some of our favorite memories of Laos. As an added bonus, I think the Vietnamese border crossing from there is much less stressful than the one near the Plain of Jars.